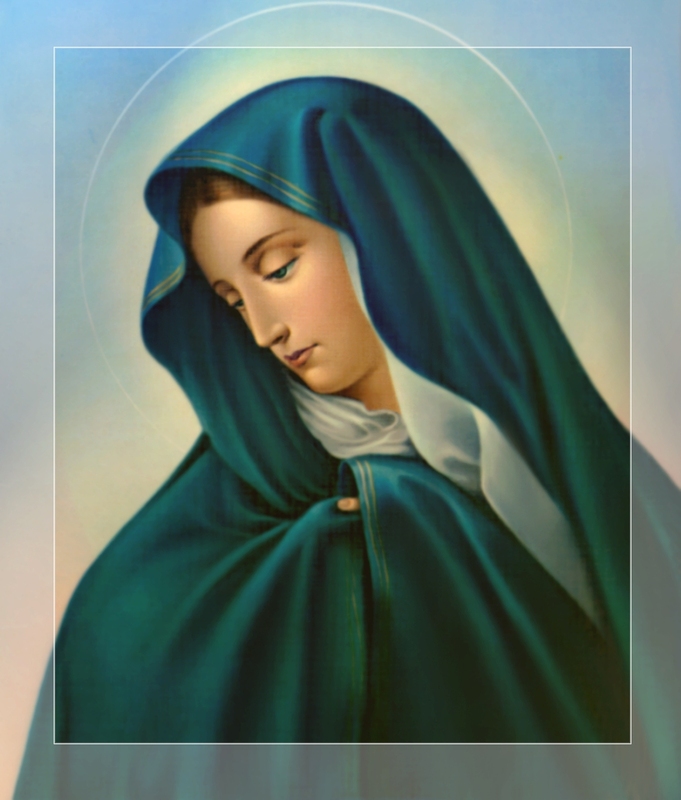 DEVOTION to the sorrows of Mary has always been a favorite devotion among Catholics. It has been sanctioned by the Church and introduced into the Missal and Breviary. In order to keep before our minds the inexpressible sufferings endured for us by the Mother of God while she lived here on earth with her Divine Son, the Church observes two feasts in honor of the Seven Dolors of Mary: one on the Friday before Good Friday and the other on September 15. She has enriched with numerous indulgences the Rosary of the Seven Dolors, as well as a number of other devotions to the Mother of Sorrows. How touching is the beautiful hymn, Stabat Mater Dolorosa, which the Church intertwines with the public recitation of the Way of the Cross. The Church spares no pains to induce her children to venerate the sufferings of their Heavenly Mother. Because of these seven sorrows which pierced her maternal heart, the Mother of God is often represented either as standing beneath the Cross, or as holding the lifeless Body of Jesus on her lap, her heart transfixed by seven swords, according to the prophecy of holy Simeon: "Thine own soul a sword shall pierce" [Luke 2 : 35]. Holy Church recalls to our mind only seven of Our Lady's dolors, but who could form an estimate of their real number! The sufferings of the Mother of God cannot be comprehended; they are inconceivable. But although her whole life was, like that of her Divine Son, a continuous series of sufferings and tribulations, the greatest woes and trials came to her during the week of the bitter Passion and Death of Jesus, when the storm of hatred and fury burst forth with all violence against Him. During our Savior's Passion, every glance at her suffering Son forced the sword deeper into Mary's soul. Every sound of His voice brought special bitterness to her Heart. Every increase of her love for Him ---- and it increased with every moment of His Passion ---- augmented her sorrows. The dearer and more precious Our Lord became to her, the more keenly she felt the heart-rending woe of His cruel and ignominious Passion! In her spirit as well as in her senses, she felt every blow that was inflicted upon her Divine Son, every insult that was offered to His sacred Person. Yet no complaint or cry escaped her blanched lips. With heroic fortitude she suppressed her violent grief, and, wholly conformed to the Divine will, generously offered the sacrifice of her Son for the sins of the world. Remember the Sorrows of Thy Mother! When the aged Tobias felt his end drawing near, he called his son and gave him wise counsels. Regarding . his mother he admonished him in this touching manner: "Honor thy mother all the days of her life; for thou must be mindful what and how great perils she suffered for thee" [Tob. 4:3: 4]. Truly, this is a beautiful lesson for us all regarding our mother, but it may be applied still more appropriately to Mary, our Heavenly Mother, the Mother of our soul. From the Cross our Savior gave her to each one of us for our Mother when He said to the beloved disciple: "Behold thy Mother" [John 19: 27]. To us Our Lord also says: "Honor thy Mother all the days of thy life and be mindful of how much she suffered for thee." It is on account of the exceedingly great sorrows and sufferings which Mary endured for our salvation that she deserves our compassion and highest esteem. If our own mother suffers long and intensely, we show our love and esteem by sympathizing with her. In return our mother loves us all the more tenderly. It is the same with Mary, our Heavenly Mother. She is greatly pleased if her children sympathize with her by thinking frequently of her sorrows. The Mother of God once said to St. Bridget, "I gaze upon the children of men to see whether anyone feels compassion for me, and, alas! I see but few. If many forget me, at least you, my daughter, do not forget me. Consider how much I have suffered." Holy Church applies these words of Jeremias to the Sorrowful Mother: "Oh, all ye that pass by the way, attend and see if there be any sorrow like to my sorrow" [Lam. 1: 12]. "To what shall I compare thee, or to what shall I liken thee, O daughter of Jerusalem? . . . For great as the sea is thy destruction: who shall heal thee?" [2: 3.] The love of Mary is referred to as a burning love which many waters cannot quench.